In an ever-more-machined world, this season we are celebrating makers and artisans. 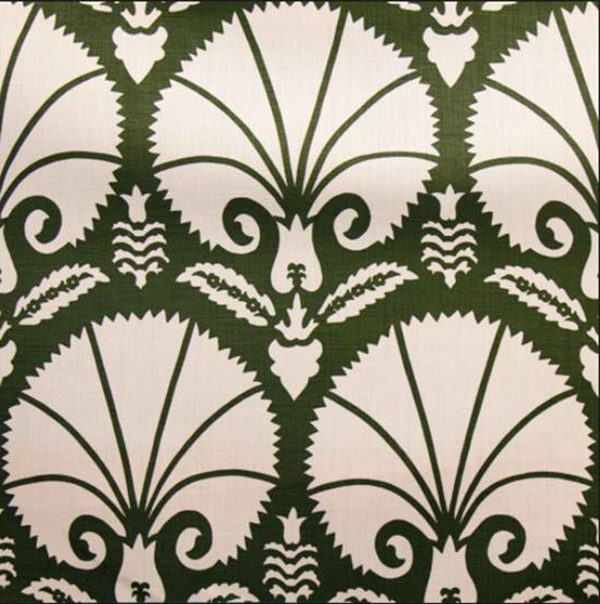 Their commitment to the creative process, rare skills and great endeavours are elevating craft to luxury status. Nothing is standard; everything is fastidiously considered. Just a handful of examples include (pictured from top to bottom): On the Fringe, a new range by Tai Ping, an exploration of hand-tufted craft. 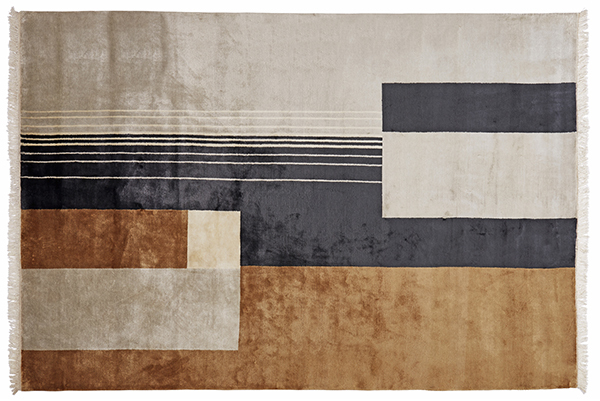 In 12 abstract designs, yarns are freed to go beyond the outer edges, allowing them to be used on the floor or be hung as artwork on the walls. 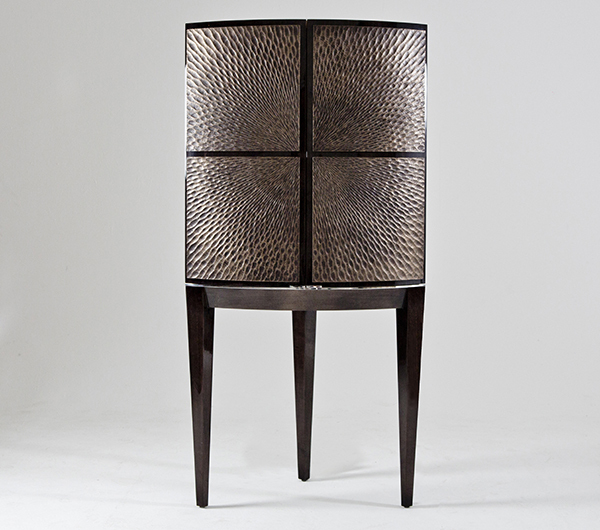 Davidson’s ‘Galaxy’ drinks cabinet is notable for its hand carved and hand gilded front panels. 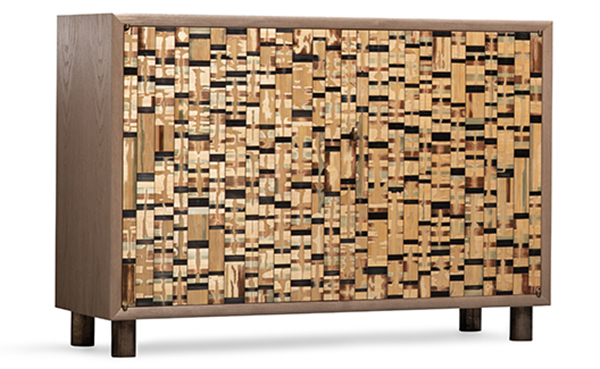 Miles x Bookshop distributes Alexander Lamont’s furniture which is renowned for its exquisite use of the ancient craft of straw marquetry where each piece is inlaid carefully by hand. 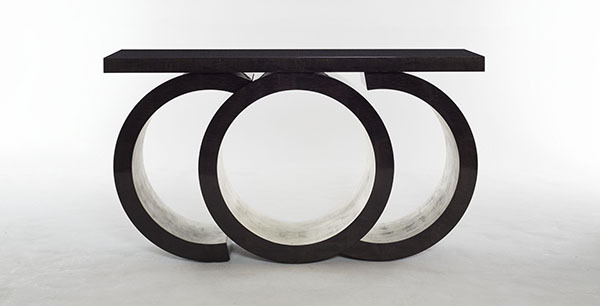 Much inspired by the work of the great Jean-Michel Frank, Lamont also uses a wide variety of rare materials and finishes – mother of pearl, patinated copper, lustrous indigo, lacquer, shagreen and smoked Spanish eucalyptus – all of which give his pieces a distinctive, rich appeal. 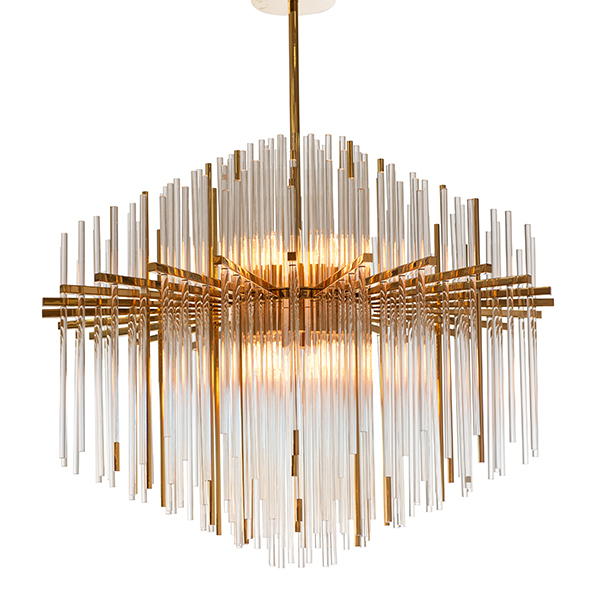 SA Baxter Foundry & Design Studio has developed collections created in collaboration with architects and interior designers. 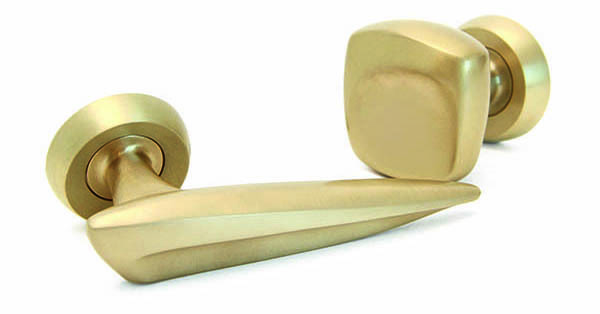 The ‘Joy’ door handles were named after a 70m superyacht designed by Bannenberg & Rowell. Artisans employ a unique wax-casting process for creating their moulds. The result is handcrafted hardware that harkens back to manufacturing of the past, updated for today. In our daily lives of information overload, design can help us escape. There is a cosmopolitan charm to design this season with a shift from the subdued to more expressive patterns that have a playful, visual language and a strong narrative. Design houses have long been inspired by different cultures and far-flung locations. 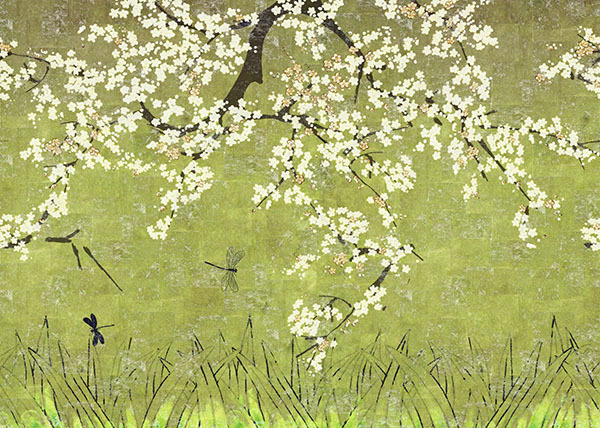 For spring, many have looked east. 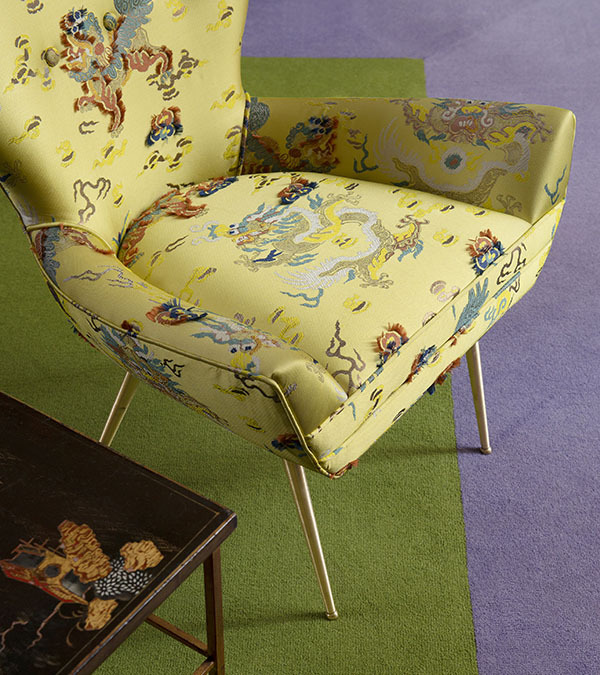 Pictured from top to bottom: Inspiration from Japanese kimonos include the ‘Scaramouche’ jacquard featuring stylised dragons by Dedar and ‘Les Cerisiers Sauvages’, a panoramic wallcovering by Elitis at Abbott & Boyd with exuberant cherry blossom. 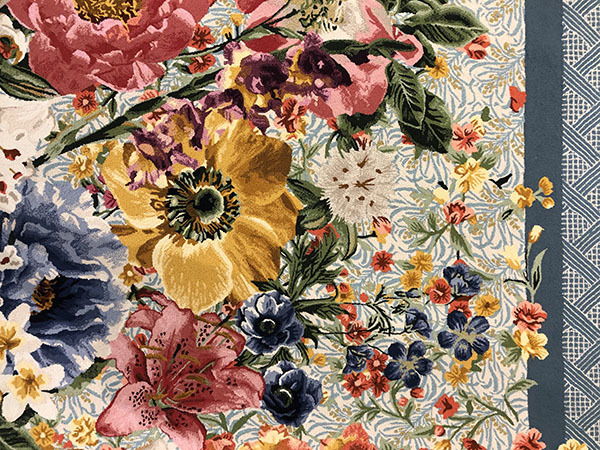 In Tufenkian Artisan Carpets, James Tufenkian’s collection of silk kimonos was the starting point for the new Rebel Silk rug collection. 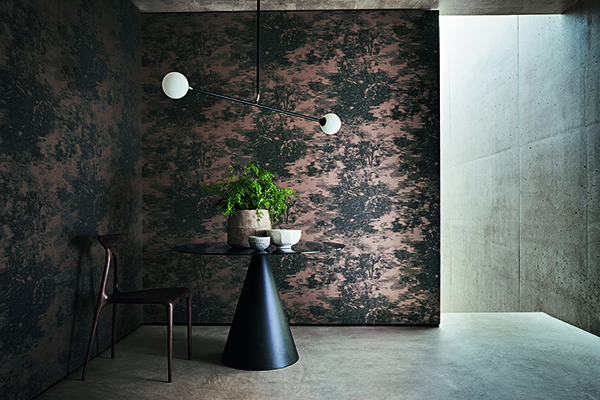 Romo has recently worked with Japanese artist Katsutoshi Yuasa, exploring time-honoured printmaking practises for the Mizumi collection by Black Edition. Art history’s greatest names have long been a source of inspiration in design, with inventive results that channel the spirit and ideas of the original masters rather than borrowing directly. 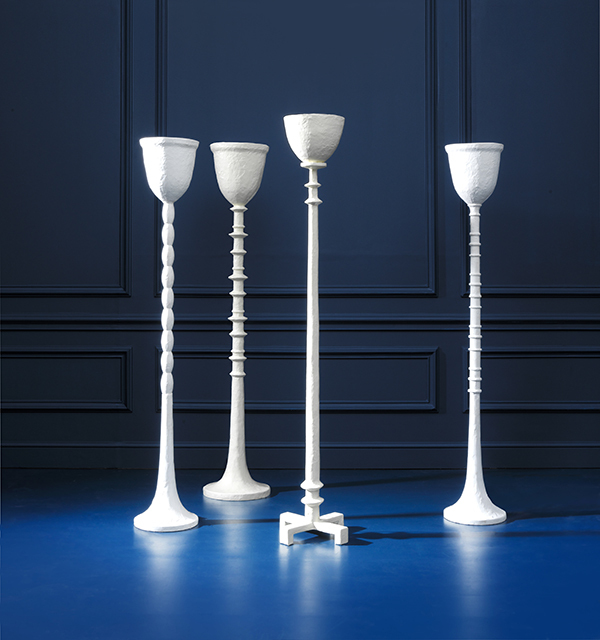 Paolo Moschino at Nicholas Haslam Ltd’s slender ‘Nicolae’ floor lamps (pictured top) are made from layers of chalky white plaster, a material favoured by masters such as Giacometti and Serge Roche. 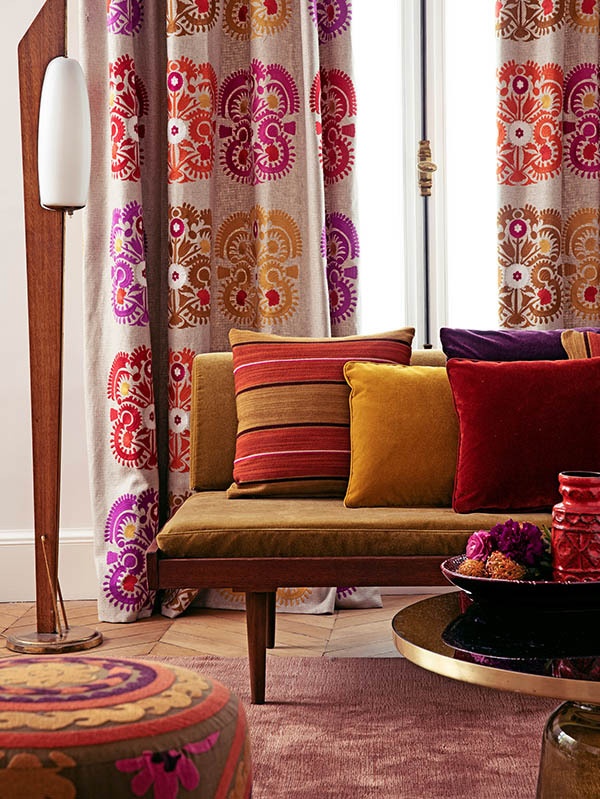 Manuel Canovas has looked to the colour sensibility of Henri Matisse, and his maxim: “Colour exists in itself, possessing its own beauty.” Pictured (centre) are ‘Mona’, a vivid embroidery (on curtains), ‘Vence’, a wool-mix stripe (on cushion), and ‘Castillon’ embroidery (on footstool), all from Colefax and Fowler. 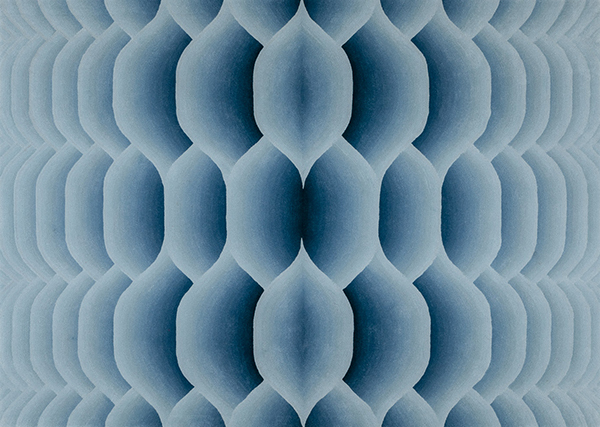 Esti Barnes of Topfloor by Esti was inspired by the father of op-art, Victor Vasarely, for a new rug collection: ‘Emboss’ (pictured bottom) harnesses the artist’s use of geometric patterns and colour gradation to achieve a similarly three-dimensional effect. 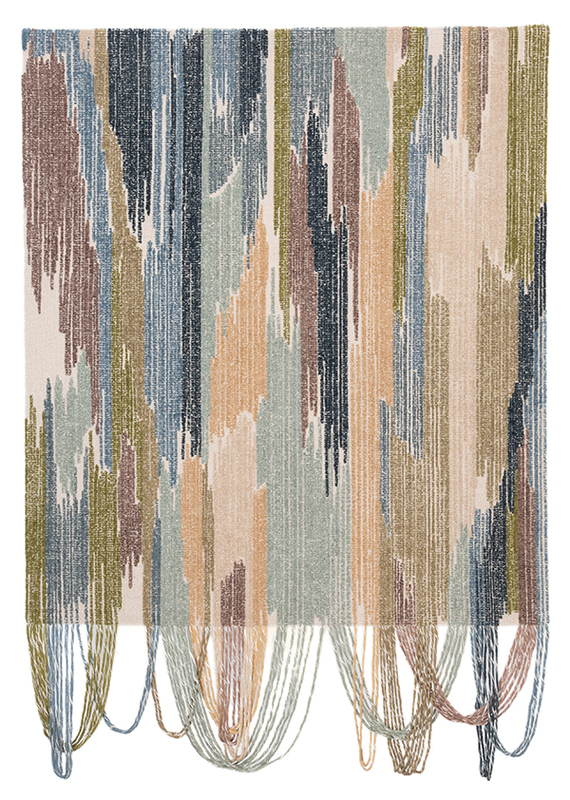 On the Fringe by Edward Fields from Tai Ping is aptly titled: its yarns have been freed to go beyond the outer edges, encouraging their use as both wall tapestries or more conventionally on the floor. 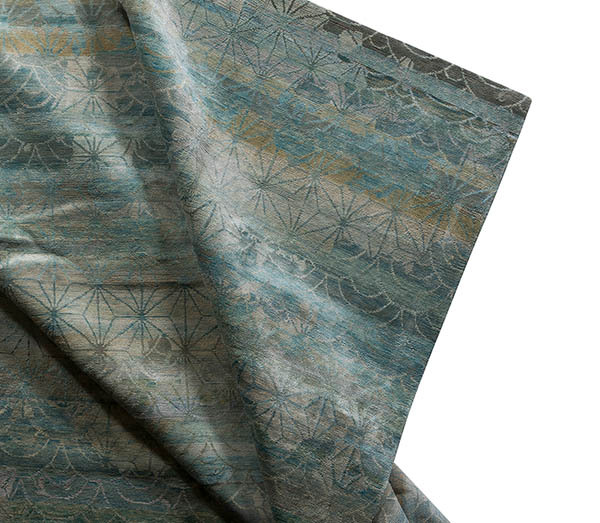 The 12 abstract designs include ‘Twilight Haze I’ (pictured). As the late Postmodern architect Robert Venturi once said: “less is a bore”. 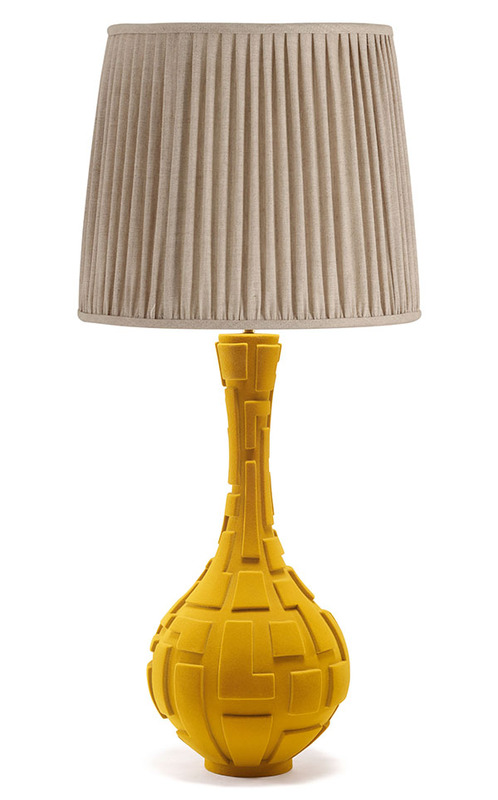 These days, highly individual interiors keep adding, layer on layer: artfully clashing patterns, unusual surface finishes from flocking to foil, and an abundance of finishing touches such as trimmings, lamps and decorative objects all contribute to a feast for the senses. Create an environment that surprises and stands out from the crowd with (pictured from top): bespoke rug (The Breakers, Adam Tihany) for Sacco Carpet; ‘Grace’ sideboard buffet, Oficina Inglesa Furniture; ‘Quadrate’ lamp base with ‘Bongo’ shade, Porta Romana; and ‘Rio Madera’ wallcovering by Casamance, from Colony. Old has never looked so right now, as we look to heritage and tradition to ground us and make sense of a fast-paced world. Just as the Burberry trenchcoat is subtly reinvented season after season, designers are showing their appreciation for what has gone before, but nearly always with a twist that makes the pieces right for today. 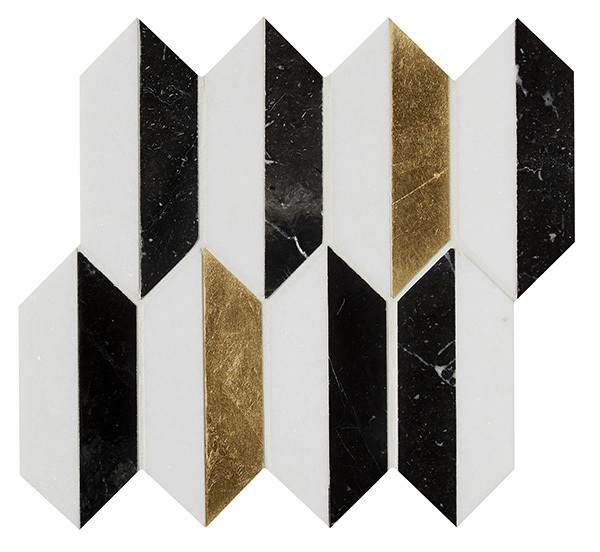 The clean lines, symmetry and sophisticated palette of Art Deco are a big theme in everything from tiles to lighting, while the highly stylised flowers of Ottoman textiles – updated with non-traditional colour palettes – is another thread. 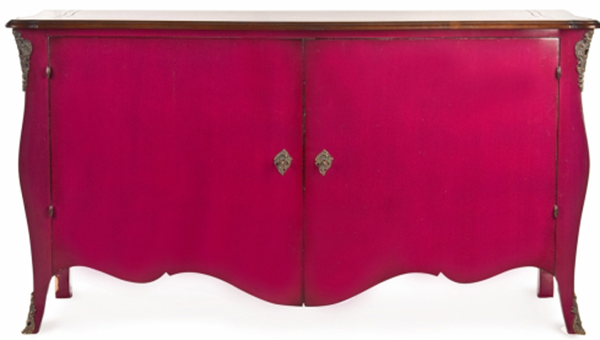 In furniture, designers seek to reinvent a classic by upping the scale or adding a new finish. Pictured (top to bottom) are a ‘Block’ rug from Birgit Israel; ‘Ritz Harlequin’ mosaic tiles from Artisans of Devizes; a ‘Scarsdale’ console from Davidson; ‘Bursa’ fabric by Paolo Moschino for Nicholas Haslam Ltd; and a ‘Strauss’ pendant from Wired Custom Lighting. 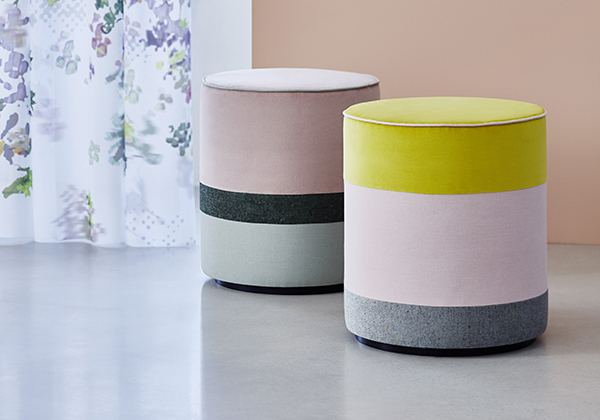 Paint-box brights bring a sense of hope and confidence to interiors, but bold, playful colours shouldn’t equal a lack of sophistication – these are approachable, mature and chic. 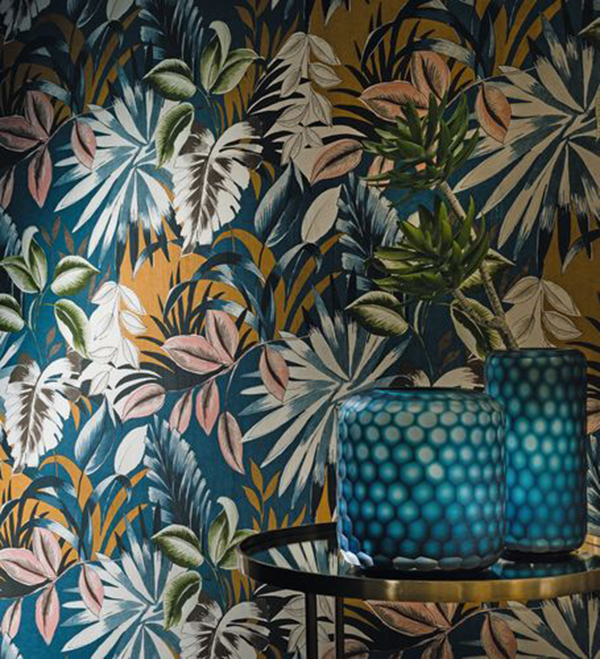 Whether used as accents or all-over for a saturating effect, colours such as pink, teal and orange are very powerful, with an irresistible vivacity. 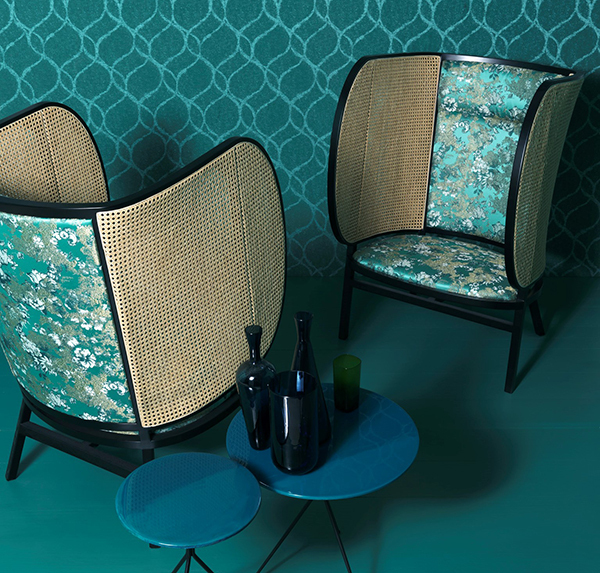 Texture and colour are inseparable, with saturated velvets the choice of many fabric houses. 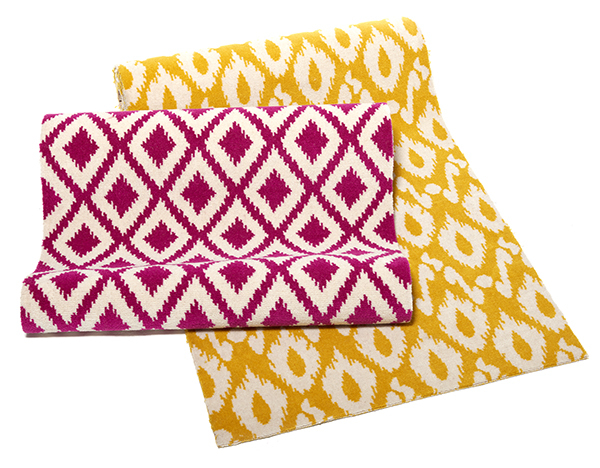 Bright hues not quite your thing? There are also pretty pastels and gelato colours, pitch-perfect for spring – soft pink, parma violet, lemon sorbet and pistachio. Pictured (top to bottom) are ‘Cristobal’ (background) and ‘Goldfinger’ (on chair) fabrics by Rubelli Venezia from Rubelli/Donghia; bespoke button designs by Wendy Cushing Passementerie from Jason D’Souza; ‘Butterfly’ carpets from Tim Page Carpets; a ‘Moreau’ cabinet from Julian Chichester; and ‘Happy Colours’ fabrics by Création Baumann.